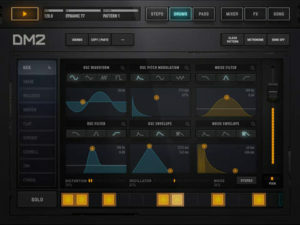 DM2 is an advanced Synthesis Drum Machine. It has been made by the core team that brought you DM1, one of the first Drum Machine for iPad, that won an Apple Design Award in 2012. Special 40% OFF price for the first week! 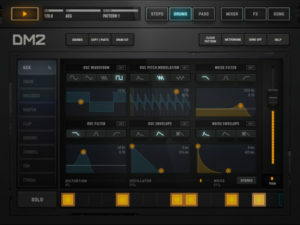 DM2 brings a new approach to Drum Synthesis with a powerful and easy to use graphic editor to create and manipulate sound. It it packed with ready-made factory Drum Kits. You can mix and match any sound from any drum kits to any track of your song. Play a song and load any drum kits (from factory kits or from any other songs) to listen to a completely new song every time. As electronic musicians ourselves, we, at Audionomy, have developed DM2 with the intention of delivering the perfect mix between fun playability and powerful sonic capacities. We always keep in mind the importance of a beautiful design with the right balance of powerful abilities while avoiding clumsy interfaces. 1 – THE STEP SEQUENCER takes advantage of the iPad multi-touch screen for fast and creative patterns drawing. The Sequences handles 16 or 32 steps patterns and is polymeric (just gently tap and drag the blue handle at the right end of each track). 2 – THE DRUMS PAGE is a powerful graphic Audio Synthesis editor. Play, experiment and discover new sounds with the 6 graphs. Tap the little magnifying glass each title bar, it will expand the graph to a bigger size for extra precision. 3 – THE PADS PAGE simply lets you play and record any beat that tickles your fingers, with automatic quantize so that you don’t miss a beat. With a Beat Repeat effect for extra fun. 4 – THE MIXER PAGE for quick and subtle sound mixing of your drum kits. Large and spacey so that you can get the big picture. Pan and Solo included. 5 – THE FX SECTION offer a powerful Quad Pads Effect processors. Refine or super charge your sounds with this powerful Master effect chain. 6 – THE SONG PAGE allows you to quickly build a song with the patterns you have created. Just drag and drop the patterns onto the timeline. Each pattern in a song can be repeated for compact Song composition. 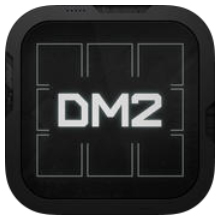 DM2 is optimized for iPad Air and more recent models. It will however run with older models.